Gislene Batista, right, attended Tuesday’s public hearing on the bill with her 11-year-old daughter, Emily. 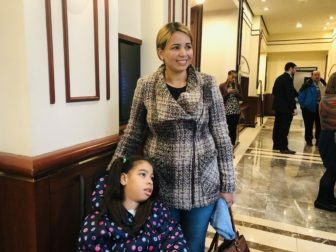 Batiste, who came to the United States two months ago, is pressing for state-funded health coverage for undocumented children like Emily. The legislature’s Human Services Committee approved a measure Thursday that would expand state-sponsored health coverage to undocumented youth. Though legislative staff haven’t developed specific estimates on the numbers of children that might be served, advocates have suggested the total would be in the thousands. “If one child in need is without health care, that is one child too many,” said Rep. Cathy Abercrombie, D-Meriden, co-chairwoman of the committee. The Democrat-controlled committee voted 11-7 to endorse the bill, which would make undocumented children eligible for the Medicaid health care program known as HUSKY A, and for the Children’s Health Insurance Program, also known as HUSKY B. The former serves children, parents and pregnant women from households earning less than 196 percent of the federal poverty level, while HUSKY B covers children from households between 196 and 318 percent of the FPL. During a public hearing earlier this week, advocacy groups testified that as many as 17,000 undocumented children and teens — up to age 19 — would qualify for coverage under this bill. According to the Migration Policy Institute, a think-tank that supports more liberal immigration policies, Connecticut is estimated to have 7,000 undocumented children younger than 16, and another 18,000 undocumented residents between ages 16 and 24. The Connecticut-based Center for Children’s Advocacy projects the cost-per-child to join the program is $2,482. Abercrombie said the legislature’s nonpartisan Office of Fiscal Analysis is expected to develop cost projections for the proposal later this spring. Meanwhile, Connecticut is facing its own budget challenges. Gov. Ned Lamont’s administration projects state finances, unless adjusted, will run $3.7 billion in deficit over the next two years combined. Still, supporters of the bill argued there is a real need among one of Connecticut’s most vulnerable populations that cannot be ignored. “I know this is a bold move, but we are a bold state,” said Rep. Lucy Dathan, D-New Canaan. But Rep. Terrie Wood, R-Darien, countered that “being a bold state has made us broke,” adding that Connecticut already is paying a stiff price for decades of fiscal irresponsibility. But Rep. Michelle Cook, D-Torrington, said the children lacking health care are victims trapped in a larger debate. “The children might not have asked to be trucked along,” she said. The bill now heads to the House of Representatives, and could be referred to the Appropriations Committee after a cost estimate has been developed. But it might not be voted upon again as a stand alone item. Provided the proposal has sufficient support among the full legislature, the HUSKY B expansion could be incorporated into the omnibus budget bill for the next two fiscal years. The legislature likely won’t act on that measure before the final weeks of the 2019 session, which adjourns on June 5.